Cake decorating and baking has stretched into the kids arena. 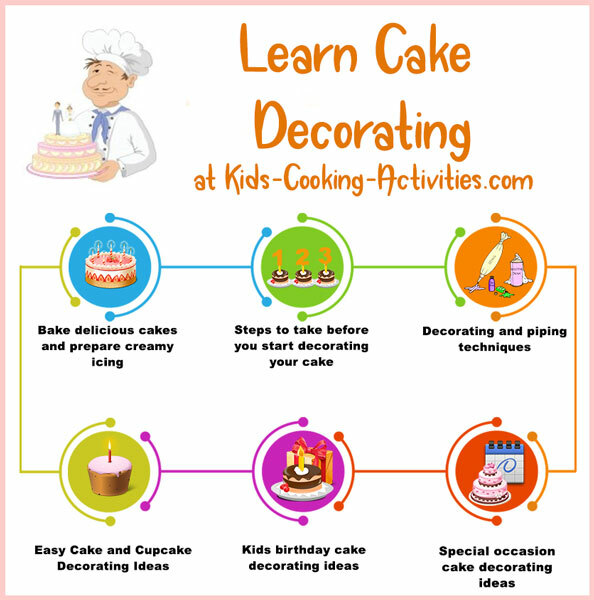 With kids baking competitions and kids cooking TV shows, kids are becoming inspired to try their hand at cupcake wars or cake decorating designs. 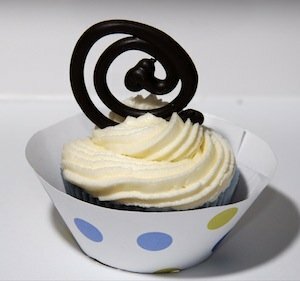 We've compiled some easy decorating ideas, cake decorating techniques and cupcake creations for your young bakers to get creating in the kitchen. 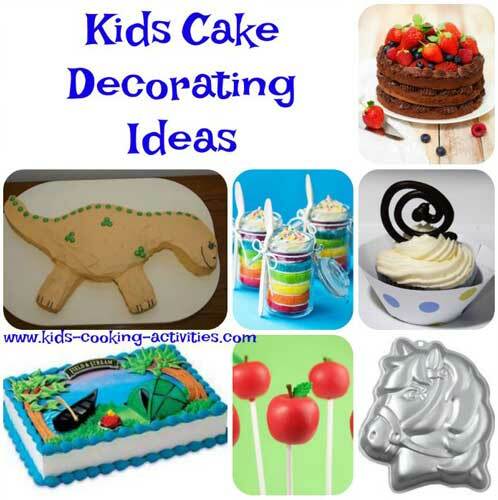 You can add some easy cake decorations like figurines or fun candles. Frost your cake and choose whatever theme you'd like your cake. Add small toys or figurines and create a "scene". 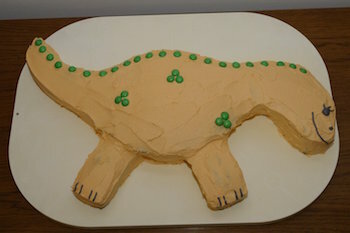 I've seen some cute kids birthday creations with a dinosaur theme using little dinosaurs. 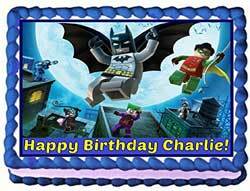 Or a Pokemon theme using small Pokemon figures and writing on such as Happy Birthday. Adding cake toppers can save you time and turn out a fun treat at the same time. Adding chocolate accents, curls or homemade chocolates is an easy way to decorate your cakes. Here's how to create them. For chocolate curls, simply buy a large candy bar and using a vegetable peeler peel large strips of chocolate off. 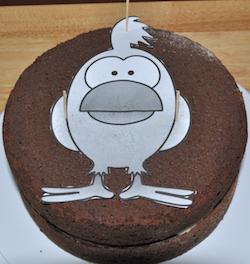 Frost your cake and add a simple border to the bottom and other designs you'd like. 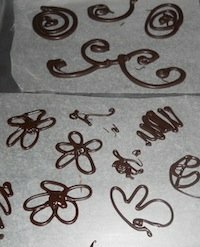 Top your cake with chocolate curls however you arrange them they turn out looking great. Using waxed paper and a bag of candy melts or chocolate chips you can easily form different shapes and designs for your cakes and cupcakes out of chocolate. Melt chocolate according to package directions. We melt ours in the microwave in a Ziploc baggie for 20 second increments. You can also melt over a double boiler and then pour into a Ziploc bag. 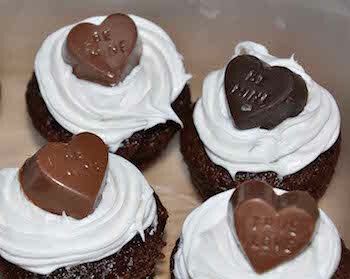 Make a very tiny snip in the corner of the bag and you have an easy to use piping bag for melted chocolate. You can use patterns off of scrapbook paper or freehand designs. Lay wax paper down on a cookie sheet and drizzle your chocolate into different designs. Allow to harden by placing in the freezer for 30 minutes. Now they are ready for you to use in decorating. 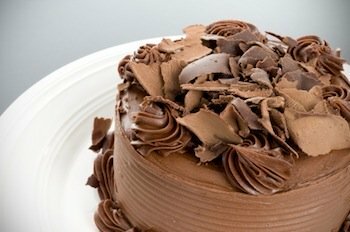 See also this tutorial on making chocolate images for your cakes. Make homemade chocolates and add to your projects. 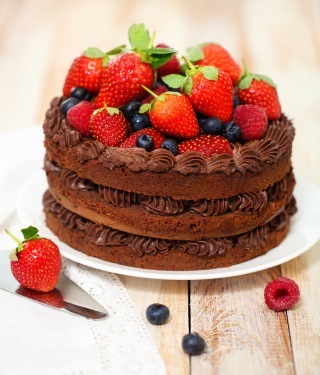 Another simple cake decorating idea is to add fresh berries. After frosting cake top with fresh strawberries or raspberries. A great idea is to add large piping stars, using a star cake decorating tip, to the top and sides and place a berry between each star. The cake below has a shell border with berries on the top. 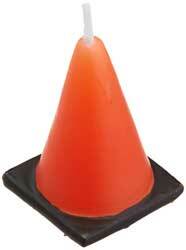 Have you seen some candles available now a days? 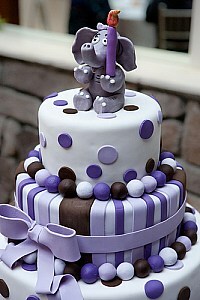 You can find a theme candle and decorate your whole cake centered around your decorative candle. 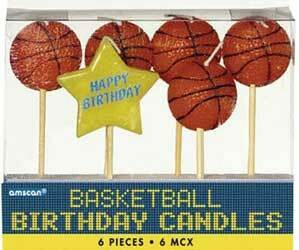 How about bowling set candles? That would be easy to create a bowling lane with colored frosting and add candles. A Batman candle centered on a circle cake that looks like a building. 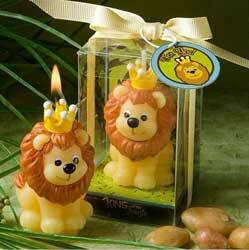 Jungle animal candles placed on green frosted grass using tip 233. Star candles for a space theme. Truck or car candles on a frosted road. Are your ideas flowing now? Take a look at some examples to get more ideas. Sugar shapes come in lots of different shapes and themes. Add sugar images to your cakes or cupcakes by adding a dot of frosting to the back or placing right on top of the frosting. You can find lots of different themes of these edible decorations. 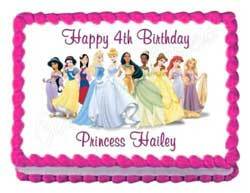 These edible cake images are great for designing. Frost your cake and add a top and/or bottom border if you choose. 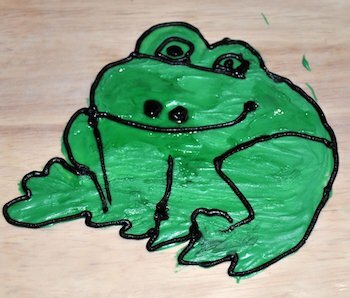 When you are ready to add your image peel off the backing and lay on top of your frosted cake. Don't take the backing off until you are ready to add it to the cake because it can dry out. When you buy the image it comes with directions also. You can also buy images for the sides. Do not open the image out of the foil pouch until you are ready to use it. One time I opened mine up because I just couldn't wait to see what it looked like, Then waited several weeks to use it. They were much too difficult to work with. Freeze your images for 30 minutes if it is too hard to peel from the backing. Use clean, dry hands to rub or tap image on smoothly. Don't forget you can decorate cakes with lots of other finishing touches. 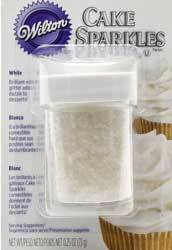 You can buy edible glitter, sprinkles and sparkle gels in lots of different colors. 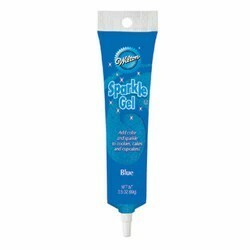 Blue sparkle gel works great for making a lake or pond look to your cake. 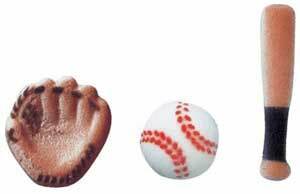 You can buy sprinkles of all different colors and combinations, also. Sometimes a great decorated creation is all in shaping your cake. When you transform a 13x9 into two triangles and form it into a Christmas tree you have an entirely different look. one round cut in half. 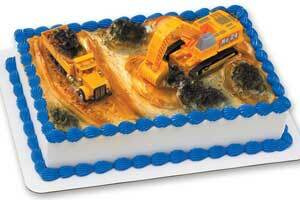 you can make some great designs by cutting your cake into whatever shape you need. There are a lot of great cookbooks out that give directions on how to cut a cake to transform it into something else. I'll include some of these below. Some of my favorite designs have been created by shaping your cake. For my son's birthday I made a dinosaur out of a 13x9 pan and some small loaf pans for the legs. Another time I made an Egyptian mummy and a rocket ship. A butterfly can be made by cutting two triangles out of a 13x9 pan and using a small loaf pan. Your small pan is the body turn the triangles to form wings. A snake or caterpillar can be formed out of pieces of Bundt pan. 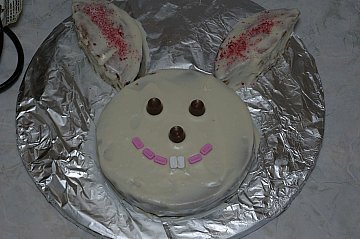 It is a lot of fun to transform a simple cake into something totally different. I think that is why I enjoy this method the most. 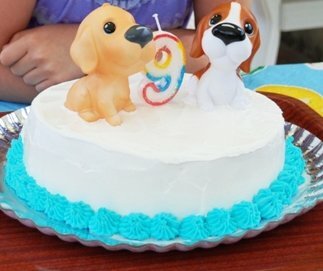 You can make your own pattern for shaping the cake by finding a picture such as a coloring book page or coloring page on the internet. Cut the outline of your picture out. Lay the picture on your cake and trace with a toothpick. Cut out your design and decorate as you'd like. 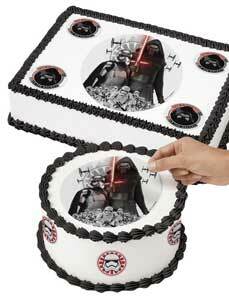 Once you cut your design out it is a matter of frosting the sides and top, then decorating as you choose. You can use candy to make faces or pipe a simple face with icing. Bake a day before and chill or freeze cake overnight. Allow to unthaw just slightly. It is easier to cut cool. Use a bread knife for cutting. Plan out on paper your design or make a pattern if needed before cutting. Cake decorating kits are a great way to decorate your desserts for a theme party if you don't have a lot of time or if you want a particular design or theme. The kits come with toppers or figures and all you need in one set. 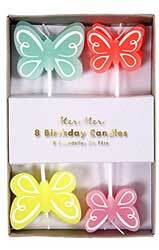 In some kits even the candles are included and some kits have edible images to go with the figurines. You can even buy kits that come with icing color too. 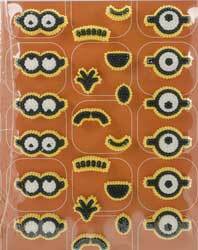 These are great kits for making character cakes and you need an exact color such as a Dora theme. 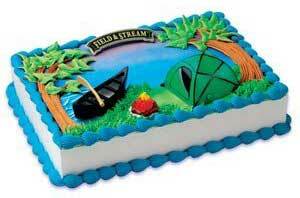 Most kits come with toppers, figurines and directions on how to create a theme cake. You can buy a basic kit or a more elaborate set. 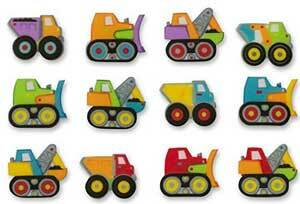 The extra fun thing about these sets are the birthday boy or girl can keep the toppers to play with after the party. 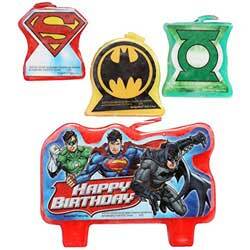 Character cake pans are great when you want a special design or popular character. If you want a Barbie doll or a Tinkerbell theme cake this is the way to do it. Every year Wilton comes out with a handful of new pans and discontinues several older pans. 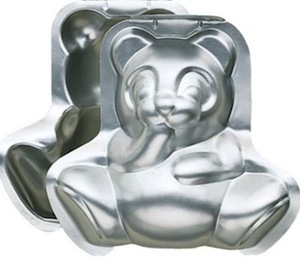 Ebay is a great source for discounted and discontinued Wilton pans. So if you are searching for an exact pan, like a Sesame Street cake pan, try checking any auction sites. I've bought almost a dozen different pans this way. Each shaped cake pan is different and some require 1 standard cake mix or recipe and some larger pans require more. 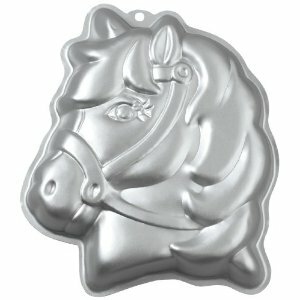 The specialty cake pan will come with instructions on how much to fill it and even ideas on how to decorate the cake. See these pages for more easy decorating help. 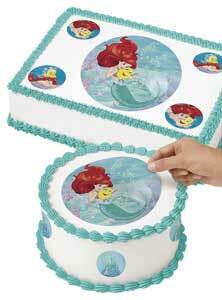 Frozen Buttercream Transfer- how to add an image made from buttercream icing to a cake. 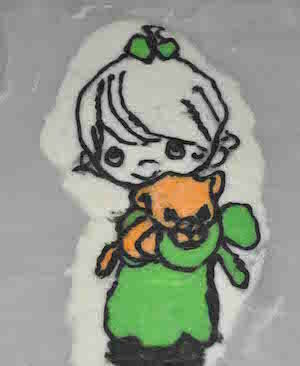 Working with Fondant - learn how to color, make homemade fondant and decorate with fondant icing. Do you have a great homemade idea? Is it edible or food related. Go ahead and share it!